The check valve TRI-CHECK combines all the benefits of the Series TRI-CON in a non-return valve. Triple-offset design with a wide seat angle and a true cone in cone, no rubbing while moving and absolute zero leakage performance. Also the statically held gasket and the no pinned disc design are used in the Series TRI-CHECK. The TRI-CHECK is equipped with a hydraulic damper and a counter weight. The damper can be adjusted to the actual installation conditions in which the valve will be used. 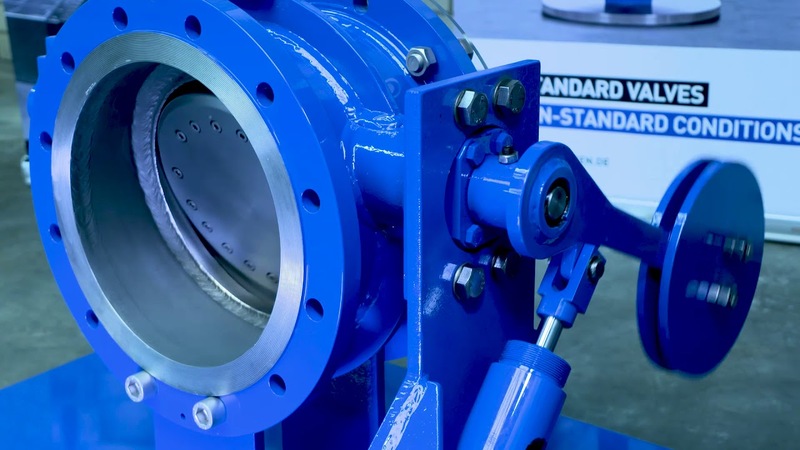 The hydraulic damping system not only reduces the risk of pressure surges due to waterhammer because of its closing characteristic, it also prevents the disc to slam in the seat. Instead the disc closes in a smooth movement which can be adjusted, so that the valve closes slowly in the last degrees of movement to protect the sealing parts. The Check Valve Series TRI-CHECK has proved to be the ideal non-return valve for single or multiple pump protection application for the last two decades. Another benefit of the valve is the variety of features. Beside the non-return function the valve can be used as a combined check and isolating valve or as a check valve with power assisted closing and opening. The Series TRI-CHECK uses a seat design which is diagonal to the flange facing in the body. As a consequence the general flow path will be increased, so that the fluidic resistance of the valve will be decreased. Another advantage is that the valve travel will be reduced, so that the valve reaches its ideal position in the flow much faster. Zwick also uses the latest EFD simulation technology to optimize the design of the series TRI-CHECK and to achieve the best possible hydrodynamical characteristics.